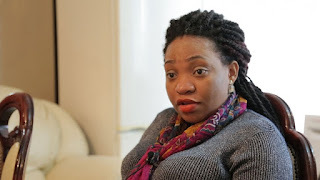 Uchechi Okwu Kanu, wife of Nnamdi Kanu the leader of the Indigenous People of Biafra (IPOB) talks about the passion Kanu has for the actualization of the country called Biafra and other issues affecting IPOB. Mrs. Kanu in an interview disclosed that her husband is passionate when it comes to defending the oppressed of the society, hence, his agitation for freedom of Biafra from Nigeria. According to her, Kanu is a man who is obsessed with Biafra to the point of sanity. Uchechi called for an unconditional release of her husband and other members of the IPOB detained by the Nigerian government, adding that the Federal Government has no case against the detainees whom she said are political prisoners. She reiterated the constitutional right of a people to self-determination which a government is obliged to permit. Kanu’s wife insisted that Nigeria government and its agents should allow Biafrans to hold a referendum (with reference to Scotland/UK).